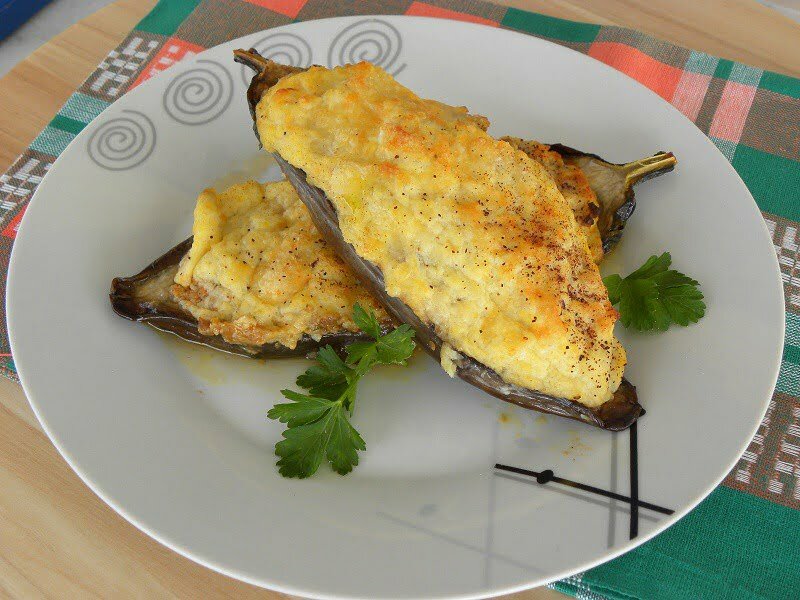 Melitzanes Papoutsakia (pronounced pah-pou-TSA -kya) are stuffed eggplants with meat sauce, topped with a rich bechamel sauce and then baked. The ingredients are almost the same with “moussakas” but they are made into individual servings. The word “papoutsakia” in Greek means little shoes and probably they are named after their shape. To me they resemble like the balarina shoes my daughter used to wear when she went to ballet when she was younger. There is also a meatless recipe from Mytilene island called “skafoudes”, which means boat. The filling is made with eggplants, which is removed to make it hollow and instead of adding bechamel on top they add grated local cheeses mixed with eggs. Most of the Papoutsakia recipes I have read want the eggplants to rest in salty water for an hour in order to remove the bitterness. This is wrong because the eggplants will absorb some water. The new varieties of eggplants rarely have any seeds and are not bitter (at least here in Greece). Depending on the recipe, if we want the eggplants not to excrete any fluids, we cut them into slices and sprinkle them with salt. We then let them sit in a colander for half an hour and then wash and pat dry them. This way some of the moisture is drawn out. Personally I don’t do this because it doesn’t bother me. For instance if I am making moussakas, I add some potatoes, which absorb most of the liquid. However, for papoutsakia, when they are baked, if there is a lot of fluid, just remove the eggplants to a platter or remove the juices immediately with a spoon, before they become soggy. The eggplants are usually fried so they absorb a lot of oil. When I was on a diet, I skipped the frying part in order to avoid too much oil by brushing them with olive oil and baking them but this takes a lot of time. However, I’ve learned over the years that I can control the amount of oil used, if I use a non stick frying pan and add the oil gradually. This way much less oil is used than if frying them in a lot of oil. I then put them on kitchen paper to absorb any excess oil. To make the cavity in order to put the filling, some of the flesh is removed. You can add part of the flesh in the filling but that would change the flavour. You will probably think “what a waste”! However, you can use the flesh in recipes, such as in pasta or make a different “melitzanosalata” (eggplant salad) which is a twist to the classic one. Based on this recipe when I made them again, I scored them and brushed them with olive oil and baked them until they became soft. You know when they are ready when testing with a fork. If the fork cannot penetrate easily, continue baking. I made a cavity by pressing them with a spoon and added some of my Spicy tomato Sauce on top. After sauteing an onion and garlic, I added the minced meat and after sauteing it, I added some of my Spicy tomato Sauce and cooked the meat sauce. Finally, I also topped it with a different bechamel sauce, using semolina, instead of flour, which makes it a little bit more grainy but still delicious. Just substitute the amount of flour with fine semolina. Wash, dry and cut the eggplants, lengthwise in two pieces. (Cut them one at a time as they oxidize. Also see note below regarding salting the eggplants). With a sharp knife score the eggplants crosswise, without cutting the skin. Heat 2 - 3 tbsp olive oil and fry the eggplant on both sides, until soft. Remove on kitchen paper, to absorb excess oil. Continue with the remaining eggplants, until all are fried. Heat the olive oil in a sautéing pan and sauté the onion until translucent. Add the garlic and sauté for a few seconds, until fragrant. Add the ground meat and sauté mixing until it turns white. Add the wine and cook for a few minutes until the alcohol evaporates. Add the tomato, carrot, salt, pepper, cinnamon, bay leaf, oregano and thyme. Cover with the lid and simmer until the sauce melds and the liquid is absorbed, mixing every now and then. While the meat sauce is simmering, prepare the béchamel. Remove the meat sauce from the heat and mix in 2 tablespoons béchamel sauce as well as the parsley. Set aside to cool. Before making the bechamel, heat the milk and beat the eggs. In a saucepan heat the olive oil and add the flour, salt and nutmeg to make a roux. Mix thoroughly using a whisk, until it starts to slightly brown. Add the warm milk, stirring constantly. Add the whisked eggs gradually, mixing until the sauce becomes thick and creamy. Remove from the heat and mix in the grated cheese. Set aside. (If, until the time we use it, it becomes too thick, just add a little bit more milk and mix). Press the flesh of the eggplants to flatten and then scoop some of the flesh with a spoon to create a cavity. Sprinkle with some salt and some cheese. Fill the cavity with 2- 3 spoonfuls of meat filling. Cover with the béchamel sauce and sprinkle some more cheese and some cinnamon on top. Preheat oven to 180oC / 350oF and bake, until golden brown on top, for about one hour. Ivy, you’ve laid out how Papoutsakia are made quite nicely. It’s one of my favourite dishes. Thanks Peter, one of my favourite as well. you’ve like my blog, i am doing my best! I’ve to admit that yours blog is perfect.. Thanks Criss, the fact that you cook is good enough for me. If you don’t try you will never learn. Ivy, I’ve emailed you recipes for the chokas. Wow nice Ivy … somehow your pix are not coming out for me on mY PC but maybe it’s issue on my side .. but love the recipe! Going to try this with last of the aubergines of the year! Very cute. My husband refuses to eat eggplant so I rarely get to indulge. Thank you Carole. Hope you enjoy it!